Siddhapura Enterprise is recognized amongst successful Manufacturers, Exporters, and Suppliers of Pillar Drilling Machine (Model No. SEW P-4). 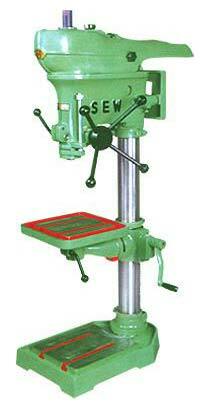 We specialize in manufacturing 19 mm Pillar Drilling Machine. We would like to take this opportunity in introducing “SIDDHAPURA ENTERPRISE” (ISO 9001:2008 Certified Company), as one of the leading manufacturer of Radial & Pillar type Drilling Machine in Bhavnagar, Gujarat, INDIA. SIDDHAPURA ENTERPRISE is a leading global name in the drill industry. Elec. Motor 1440 RPM 0.50 H.P.